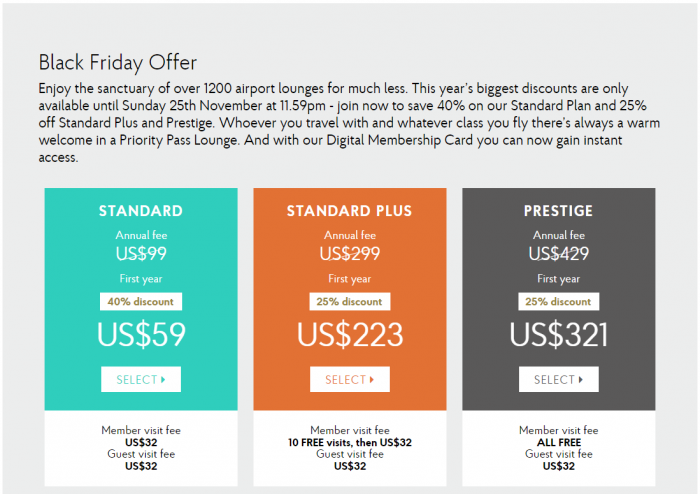 Priority Pass has launched their Black Friday offer that is 25% to 40% off paid memberships until November 25, 2018. Priority Pass allows members to access more than 1,200 lounges worldwide and now also dine at number of airport restaurants. You can access this offer on Priority Pass website here. The 40% off is only from the base level membership that doesn’t allow any free lounge visits. The 25% off is from the Standard Plus and Prestige. My Priority Pass membership came with American Express Platinum and I have found it to be useful. I’ll probably use it 20 or so times during the 12 month period. Sometimes the Priority Pass lounges have been better than the airline assigned ones, I have flown with an airline with whom I don’t get lounge access at all or the airline doesn’t provide one at that specific airport. Not sure how many paid individual members they have but these can make sense for those heavy travelers that don’t have access to airline lounges but travel from/via airports that have Priority Pass ones. Next articleReader Question: British Airways Data Theft & Card Compromised?